Louisa qualified with a Masters in Physiotherapy from Leeds Metropolitan University in 2011 but also has a Masters in sports medicine where she worked in the sport and exercise field with leading businessmen, Formula 1 drivers and teams, and club and elite level athletes in rowing and triathlon. 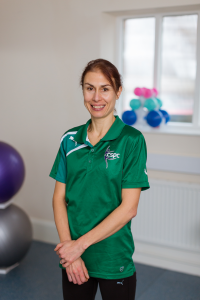 As a physio she has worked in private practice with a variety of individuals from those looking to overcome injury, accident and surgery and improve general day to day function, to elite and amateur triathletes, semi-pro and recreational cyclists who want to prevent and overcome injury, and maximise performance. She has worked with many cyclists who were doing the Lands’End to John O Groats and other such like endurance events performing bespoke MOT’s and bike fits. Louisa has also worked at elite triathlon training camps, treating athletes, prescribing functional prehabilitation/rehabilitation exercises and assisting with the coaching. She was locum physio for Triathlon New Zealand at their European camp last year for two months where several of the athletes were Olympic bound. She has also worked as a triathlon coach with triathlonscotland and a variety of amateur athletes in West Lothian and Yorkshire conducting training sessions, drills and skills sessions and working on movement patterns. Louisa places a high priority in identifying and correcting movement patterns to aid recovery and prevent future problems using a variety of manual therapy techniques and specific exercise prescription. Over the past few years she has been using visceral and cranial work, which has revolutionised the way she treats and understands the effect this has on pain, movement and injury. She is passionate about the holistic approach, appreciating the psychological impact pain and injury has on people. As mentioned, Louisa is qualified in bike set up where she’ll fit you and the bike together as one unit, imperative for maximal and efficient power output, injury prevention and comfort. This comes from her experience as a physiotherapist but also having worked and been coached by world class triathlon coaches. You can book a CSPC cyclist’s full body MOT with bike fit, a 90 minute appointment with Louisa. Louisa, in her past life, was a professional triathlete representing Great Britain in long course and ironman distances. She was 3rd in her first Ironman at Ironman Lanzarote but her career ended there following a serious biking accident. This did not stop her as several years later she retrained as a physiotherapist, which she loves, and keeps herself active, albeit at a more sedate pace. Her main focus now is to help others overcome injury, manage pain and chronic conditions and aid realisation of dreams, whatever that may be. She is passionate about what she does, enjoys a challenge and will work hard to get you where you want to be, like everyone at the clinic. Louisa in her free time enjoys hill and mountain walks/shuffles, riding her bike, yoga (which she is incorporating into her treatments) and has a keen interest in cooking, diet and health and loves concocting real, raw and alkalising food recipes with a special interest in natural energy food sources for endurance, sports and health.